This Video Poker Games Glossary is divided into 3 parts that includes an Introduction. Video Poker Games, technically slot machines, are categorized as strategy games at gamerisms. This glossary describes most of the VP versions available online and off. Video Poker or VP strategy games require knowledge of paytable schedules to determine the more profitable versions to play and optimum strategy for each hand. 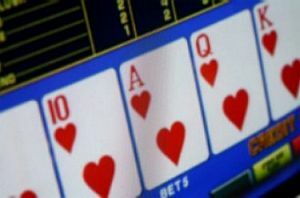 The first part or Introduction describes video poker paytables, top 10 versions and continues with the letters A-B of the video poker games glossary concluding with Extra Video Poker Quiz Questions. The first rule is for players to learn about paytables that will establish the best versions to play. All VP payoffs are listed on the payout schedule at each machine. Paytables display how many coins are returned when you hit a certain hand playing 1 single coin or any number of coins to the max. of 5. Example: for Jacks or Better, locate the 1 coin payouts listed on the far left side. Scan down to the full house and flush. How many coins are paid for each under 1 coin? The best version pays 9 coins for a full house and 6 coins for a flush and is a 9/6, ‘full-pay’ Jacks or Better game. Any lesser paytable is considered a ‘short-pay’ and the overall return is reduced. Secondly, enthusiastic players should learn optimum strategy for each hand of a particular VP version in order to receive maximum overall payback. Listed below are the Top 10 VP versions based on paytables and availability in casinos online and off. 2) 7/5 Jokers Wild. 5 kind pays 1000. Quad pays 100. Pair Kings+ is the min. payout. 3) 10/7 Double Bonus. 4Aces=800, 2 pair pays 1. Full House=50. 4) 9/6 Double Double Jackpot Poker. 4KQJ with KQJ kicker=800. 5) 18/15 Pick ‘Em Poker pays 90 and 75 coins for full house and flush accordingly. 6) 9/6 Jacks+, 2 pair pays 2 or 10 with max. coin in play. 7) 8/5 Jacks+ Bonus: 2 pair pays 2 or 10 with max. coin in play. 4Aces=400. 8) 9/6 Double Double Bonus. 4Aces w/234=2000. 4-2s, 3s, 4s w/kicker=800. 9) 9/5 Triple Double Bonus. 4Aces with 2, 3 or 4 kicker pays same as Royal Flush. 10) 9/5 Super Double Bonus. 4Aces=800, 4Kings, Queens or Jacks=600, 4-2s, 3s, 4s=400 and 400 for Straight Flush. The first two numbers for the video poker versions above reflect the payouts for a full house and flush as per one coin payout. Thus, the video poker version, 10/7 Bonus VP #3 means the payout would be 10 coins for a full house and 7 coins for a flush for a one-coin bet. Exception: Deuces Wild versions reflect the payouts for a straight flush and 4 of a kind as per one coin payout. The best payouts for VP strategy games are achieved by a combination of maximum coins in play, full-pay schedules, comp points and optimum strategy. Aces with a Kicker: bonus credits are awarded for quad aces with a specific fifth card. Aces and Faces VP: bonus credits for Aces, Kings, Queens and Jacks. All American VP: straight flush pays 1000 coins for this version. Basic VP: single payline VP game using one 52-card deck. Unlike progressives, basic VP has a constant top jackpot payout. Example=4000 coins for royal flush. Bet Max: to bet the max coins, usually 5, for each play/spin at these strategy games. The best payouts occur when the maximum bet is wagered. If you want to receive full value for your VP play, this is the best strategy. Bet 1 Button: pressed when betting less than max coin. Press 1 for 1 coin, 2 for 2 coin, etc. Boat: jargon for a full house. Example=3 Kings, 2 Queens. Bonus 4-of-a-kind: pays bonus credits for certain quads and/or certain quads with a specific fifth card. Example: Bonus poker=400 credits for 4 aces or Double Double Bonus Poker=2000 credits for 4 aces with a 2, 3 or 4 kicker. Bonus Deluxe VP: any quad pays 400. 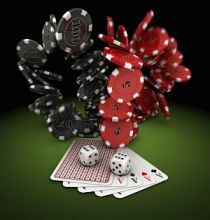 Bonus Deuces 9/4 VP: payout of 2000 for 4 deuces with an ace as the fifth card plus higher coin for five 3’s, 4’s and 5’s. Bonus Jacks+ VP: 2 pair pays 2, four aces pays 400. 1) When playing Multi-hand Video Poker for 3, 5, or up to 100 hands at one time, how does optimum strategy change? A. No change. Play each hand the same and look for full-pay VP paytables. B. You should concentrate on the high paying quads (4-of-a-kind) and Royals as there are more opportunities to connect with multi-hands in play. C. I can play short-pay versions as there are more hands in play. 1) A. Stay the course is the best strategy. Play each version/hand with the same optimum strategy as you would with a single full-pay version with maximum coin bet, of course. 2) With the Jacks or Better VP version, when does a Royal Flush pay out on average? A. 35,000 hands on average. B. 40,000 hands on average. C. 45,000 hands on average. 2) B. Approximately 40,000 hands which is one of the lowest averages for VP versions. It’s just the waiting for that payday that is so frustrating, yet rewarding when you step up to the challenge in the VP world. The word royal takes on a new meaning when applied to the language of Video Poker. A gamerist will find that the Video Poker Games Glossary in 3 parts will set you flush with this skill game.